Scotchgard 3m Brand can be applied with the carpet has been clean and is wet and is sprayed with 70 psi, then raked into the fibers and hug up to dry. Scotchgard Protector, combines and proper care and cleaning, will make a big difference in retaining your carpet and upholstery’s beauty over many years or regular use. Just how long your carpet and upholstery will look good depends on a number of factors, including household traffic patterns, exposure to soiling and stains and, or course, proper cleaning and maintenance (vacuuming and spot removal). So, to get the most out of your Scotchgard investment, here are a few tips you should know about caring for your carpet and upholstery fabrics. Carpet and upholstery treated with Scotchgard protector will stay cleaner longer — a real time and money saver. For best results, call your professional carpet cleaner. Will Scotchgard protector change the feel of my carpet or upholstery? With some carpets and upholstery you may experience a slight change in feel after Scotchgard protector has been applied. However, routine vacuuming and traffic will bring back the original feel. Will Scotchgard protector be effective after carpets and upholstery are cleaned? How long will the protection last? How long the protection last depends primarily on how much use the carpet and upholstery receives and how well it’s cared for. Your professional carpet cleaner can determine whether or not adequate Scotchgard protector remains after cleaning. For optimum performance it’s best to have Scotchgard protector re-applied after a professional cleaning by an authorized Scotchgard protector applicator. The most important thing to remember is that even with Scotchgard protector, carpet and upholstery require good housekeeping practices. Is Scotchgard Carpet and Upholstery Protector used by professional cleaners in either residential or commercial applications safe to use? 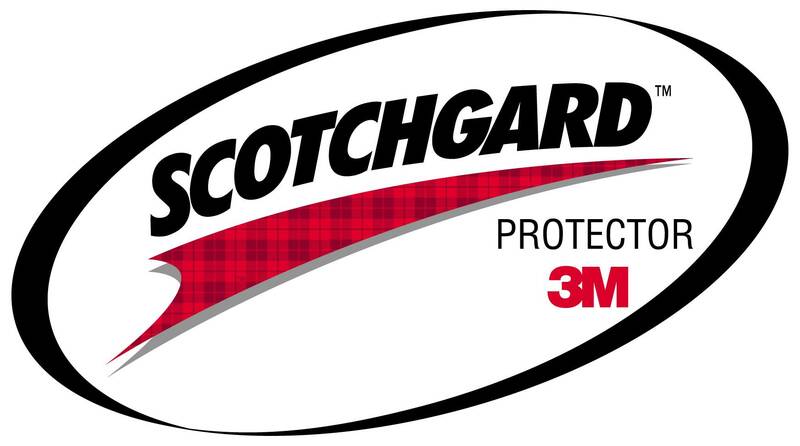 Yes, 3M products sold under the Scotchgard brand name have been thoroughly tested and are safe for thier intended use. Scotchgard protector products manufactured after December 31, 2000, do not use, contain, or degrade to PFOA or PFOS. The new materials are deemed acceptable for sale by the U.S. EPA and other environmental agencies around the world. Remember to clean up a spill immediately after it occurs. Carpet and upholstery with Scotchgard Protector will be easier to clean than untreated carpet and upholstery because the stain will be confined and not spread out. Butter, salad dressing, hair oil Use a solvent spot cleaner like Energine Spot Remover or a powdery cleaner like K2r Spot-lifter. Carefully follow the directions on the label. Ice creams, gravy, coffee with cream Use both cleaning agents for greasy and water soluble stains. Always apply cleaning solution to a small inconspicuous areas carpet or upholstery, blot with a white cloth and check for color transfer before using. If color transfer occurs, the carpet or upholstery is not colorfast ans the treatment should not be used. If liquid, blot up as much as you can with a clean cloth, pressing firmly all around the spill to absorb as much o the liquid as possible. If the material is solid, scrape up what you can with a spoon or the dull edge of a knife or spatula. Always work from the outside of the spill toward the center. Wipe area gently, working from the outer edge to the center of the spot. Turn the cloth frequently so it is always clean, and do not get the carpet or upholstery excessively wet. Let dry, Then crumble and remove the excess dirt. Spot-clean as a water soluble stain. Blot up as much as possible, Next, dilute the stain by cleaning with a cloth dampened with plain water. Then clean with an acidic mixture, such as one quart water and one teaspoon white vinegar; or use club soda. Wipe up as much as possible. Then use regular nail polish remover, without lanolin, applying it with an eye dropper. Wait a few seconds, then blot with cloth, Repeat until all materiel is removed.